Kitty Wong, Immediate Past President of the Alliance and President of K&A International, Taiwan, and Kaoru Shibuta, the Alliance's Secretary General and Executive Managing Director of Congress Corporation, were invited by the Council of Local Authorities for International Relations (CLAIR), Japan, to present lectures in Tokyo. This all started as Congress Corporation, the Alliance partner in Japan, was appointed as "Promotion Advisor," to CLAIR for consulting on formulating the program and speakers for their seminar, and proposed Ms. Wong as a speaker. Founded in 1988, CLAIR is a government-affiliated foundation that works to support the internationalization efforts of regional governments in Japan through providing training opportunities, fostering people-to-people exchanges and other initiatives. The CLAIR Seminar was held on February 22nd in Tokyo. Ms. Wong and Ms. Shibuta spoke on various MICE trends for the benefit of Japanese regional government and convention bureau representatives. Ms. Wong's presentation, "MICE in Taiwan," focused on Taiwan's cities that have succeeded in developing their MICE industries. 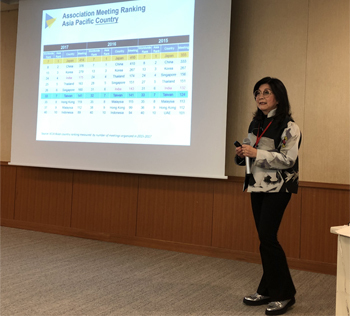 Introducing the main players in the meetings/events industry in Taiwan, Ms. Wong presented case studies on the Asian MICE Forum (AMF), an event held strategically in regional cities in Taiwan, along with the road to Kaohsiung's success in winning the ICCA General Assembly in 2020. 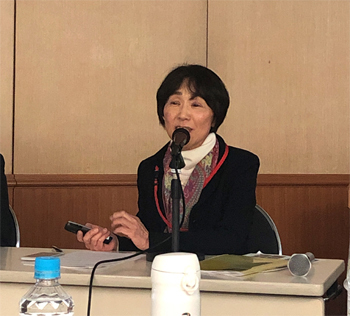 "From the MICE frontlines – Regional cities' potential from the perspective of a PCO" was the title of Ms. Shibuta’s presentation, which centered on three important factors in inviting MICE events: "Content, Capacity and Cooperation." Content: What types of research institutions and universities are close to a city that could be the seeds of medical meetings? Capacity: Know that city's venues. Cooperation among all local stakeholders and getting the local community involved, is another key to success. Using examples of actual events planned and managed by her company, Ms. Shibuta illustrated the potential and future prospects for medium-sized cities to host meetings and events. Ms. Shibuta feels that these partnerships are important for the continued progress of the meetings industry. "Nothing is more impactful than stakeholders coming together and discussing their respective needs and goals," says Ms. Shibuta. "These exchanges are at the heart of CLAIR, and I feel so privileged to be a part of this important event." Says Ms. Wong: "Not only is the CLAIR seminar a valuable platform for important dialogues, but this particular speaking occasion reflects the opportunities afforded by the World PCO Alliance partnership. Bringing together global players while giving a voice to local perspectives is what the Alliance is all about."